A butternut squash purée recipe? Despite the soaring temps here in Ohio I have fall baking on my mind. 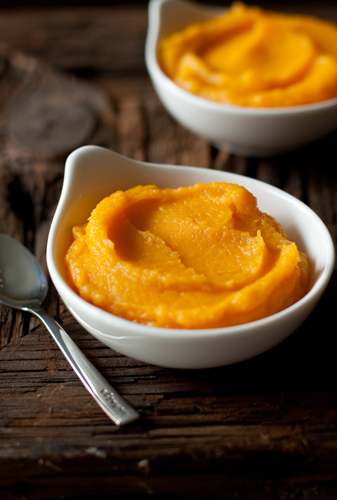 I know this post may not seem like the typical desserts that I post on My Baking Addiction, but trust me when I tell you that this butternut squash purée recipe will come in mighty handy in the upcoming months. I adore butternut squash and find it to be a fabulous addition and/or substitution in all types of recipes. I have been busy in the kitchen and have a few amazing butternut squash dishes and desserts that will post during the fall months. 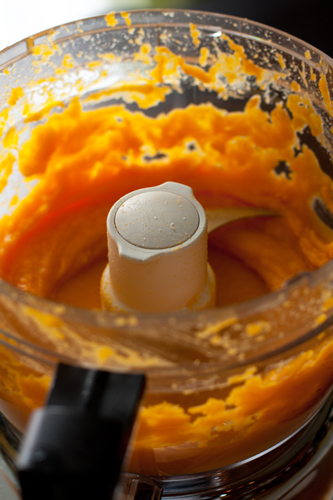 Each of the recipes will utilize this butternut squash purée in one form or another. I had originally planned on turning this recipe into a vlog, but when I went to record it, I realized my video camera battery was kaput. So here are a few step by step photos just in case you are curious about the process. Sprinkled with diced butter and sugar. All ready to be roasted. Fresh out of the oven and ready for a whirl in the food processor. I will tell you that this stuff is highly addictive on its own, Brian and I kept sneaking spoonfuls out of the food processor as I was adjusting the seasoning. I imagine I will be whipping this up on many occasions in the near future any my guess is that you will too. Thanks for stopping by…stay tuned later in the week for the first butternut squash recipe. 2. Slice the butternut squash in half lengthwise; scoop out and toss the seeds. Place the halves flesh-side-up on a foil-lined baking sheet. 3. Sprinkle the diced butter and brown sugar evenly on both halves. 4. 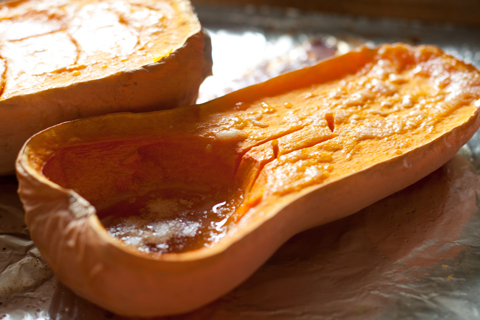 Roast for 45-60 minutes or until the butternut squash can easily be pierced with a knife. 5. A liquid mixture of butter and brown sugar will form in the wells of the squash, make sure you include this deliciousness with the puree. 6. Remove squash from the oven; allow to cool for about 10 minutes. Scoop out the flesh and liquid and place into your food processor or blender. 7. Add the cinnamon, nutmeg and salt; pulse until you reach a creamy consistency. 8. If you are serving this delicious puree as a simple side dish, adjust the seasoning to your taste and toss in a couple more tablespoons of unsalted butter. If you are using it for the recipes that will be posting on My Baking Addiction, leave the puree as written. The size of butternut can vary greatly so it is important to adjust the level of seasonings according to your tastes. This recipe can yield anywhere from 1 to 2 cups of purée depending on the size of your squash. This makes me even more excited for Fall! I love butternut squash. I crave butternut squash and look forward to seeing more recipes. I make the Barefoot Contessa’s butternut squash risotto and it’s to die for. I have to force myself to hold back on eating all the roasted cubes before they go into the risotto!!! Okay, you just made me feel okay about the fact that it is gray and drizzly here in Portland today. Bring on Fall!! I love butternut squash puree! However, last year I spent $18 for a jar of it. Gasp! I don’t have a food processor=(( Is there an easy way to still make this? I realllly look forward to your upcoming recipes including this squash! Use a blender in place of a food processor. It’ll do the same thing. Fall is my favorite season for baking! Last week’s cool weather here in NYC totally got me in the mood for all of my Fall favorites. This looks fantastic…can’t wait to try it! @ Sherry…you could try using a blender, or maybe even a hand-mixer (a bit more whipped than pureed, maybe). You are talking to the girl who roasted kabocha squashes all summer long and ate them for dinner, so in my opinion, it’s never too early for winter squash! this looks absolutely delicious. And such a healthy dessert! I can’t wait to see how you use this in recipes to come! I adore butternut squash!! Healthy and tasty! I love Butternut Squash and can’t wait for fall! One of my favorite recipes is this: Pasta with Butternut Parmesan Sauce. Love the white bowls and wood background on this post. Okay, I’m a butternut freak, so I can’t wait for your recipe. FYI-I found the pan. Thanks for your suggestions! Wow, awesome idea! I do make butternut squash puree but give it an Indain twist with oion, garlic and a little hint of coriander and cumin powder. This one sounds amazing as well. Will give it a try for sure! I would be sneaking spoonfuls myself…but I’m looking forward to seeing what you do with this. I love butternut squash! I have made a similar recipe before and loved it. Great for the coming fall weather. oh my gosh such a beautiful shade of orange. perfect for fall. this looks simple and amazing! This looks soooo good! I love ANYTHING squash. Fantastic photos! This post has me excited for fall! This looks absolutely delicious and makes me even more anxious for the flavors (and temperatures) of fall! Butternut squash has such a gorgeous flavour. Ho wlovely for a lovely dip. I would use this to make gnocchi. I have made it before but with sweet potatoe puree, garlic and thyme. Delicious! I love butternut squash and this looks fantastic!! Thanks! Can I use Buttercup Squash in place of Butternut Squash? 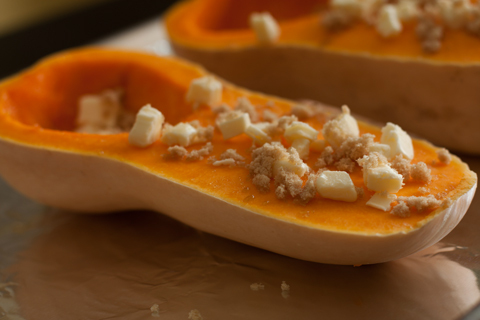 I’ve never had butternut before…..
Hi, I´m planning on celebrating my 1st Thanksgiving away from the US. Do you think I can top this puree with marshmallows, just the way it´s done with the Sweet Potatoes Puree? Thanks for your help! This is a wonderful recipe — we made the puree and then the butternut squash bread, and both are absolutely fabulous. We used a huge butternut squash that had been sitting on the counter longer than I’d like, but this recipe turned it into gold. We used less than half our puree when we made the bread and can’t want to figure out what to do with the rest. I’ve roasted and pureed butternut squash before, but this recipe is definitely a step up (probably thanks to the butter and sugar). :o) Thanks for a terrific recipe — exactly what we needed for our Thanksgiving. Thanks so much for reporting back! I am thrilled that this recipe was a success for you. WOW! You were not kidding on how good just the puree is!!! I rubbed it with coconut oil and butter and cinnamon only and skipped the sugar. I had to force myself to set aside a cup of it so I can make the bread later. I started last year roasting the cubes of butternut squash to make homemade ravioli but even just plain this squash is just so so good. Oh happy happy squash shopping! I bet the coconut oil gave it great flavor, what a good idea! Have a lovely day and thank you for following MBA! I prepared this purée for the first time to use in my first attempt at making butternut squash bread. The purée came out perfect. This is a simple, easy to follow recipe and I give it ten stars. Thanks for sharing it and helping to make my baking journey such an enjoyable one! I am so glad you love it, Kay! Thanks so much for stopping by and leaving your feedback!